I recently read that several decades ago comic book publishers used to provide their books to newsstands and stores in bunches, but whatever the newsstands and stores did not sell would be returned to the publisher and essentially not paid for. The publisher having no use for a product not sold would simply trash the comic books. That's right. Early issues of Captain America, the Fantastic Four, Action Comics and so forth, which would be worth in the thousands today, were just scrapped (possibly a reason some of the old books are rare and worth as much as they are). Unfortunately for comic shop owners, these days you have to estimate how many issues you think will sell of any given comic, buy the product in bulk and hope that they mostly all sell. There are no refunds for old books anymore. Comic shops are stuck with the over abundance of books they estimated would sell more but did not. So instead of refunds for a book that just didn't sell, there are only stacks of Daken Dark Wolverine #4. My local comic shop will at times, as every shop does, miscalculate what they think may catch their consumer's interest. When this happens they usually sell the issue a week or two later for only a dollar to at least get something in return for books already paid for. For this reason I sometimes hold out on books they bought a ton of...even books like Uncanny X-Force #1 which is an amazing book, but the pile they had on Wednesday could have fed a family of six for three weeks...a family that ate well scripted story and beautiful art! Anyway, if you can hold out on a good book, sometimes you can get a great deal a week later. Now where as the decent books sell for a dollar a week or two later, other extra books just won't sell. 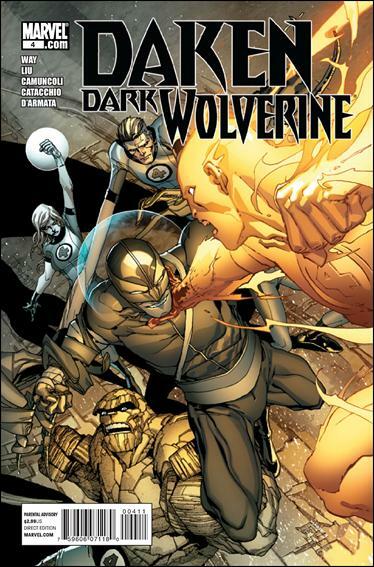 So what did my shop do with one such book titled Daken Dark Wolverine #4? They just gave it away for free. Yep, it was thrown in...on the house. It's really a great idea. Who knows, maybe a person who they give the comic book to will actually end up liking it. That person may then buy the next issue and so on. Besides the good call on possibly enticing a future sale, the giving away of the unwanted product feels a lot like the Seinfeld episode where Elaine has a muffin shop called "Top of the Muffin to You" which only sells muffin tops. The shop doesn't know what to do with the unwanted bottoms so they give them to the homeless shelter. The homeless eventually complain because even they don't care for the muffin bottoms. Just because they are homeless and hungry doesn't mean they'll take anything. Great episode, by the way. This leaves me with a couple of thoughts in regards to the comic of the day. First off, just because the book is free doesn't mean I want a piece of scrap. Yet secondly, and on the contrary, maybe Daken Dark Wolverine #4 eventually gets scrapped by everyone (the shops and the poor people they give them to). Who knows...one day maybe Daken Dark Wolverine #4 can be this generations old Captain America, the Fantastic Four or Action Comics issue and be worth thousands one day. so, how bad was it. Haha. A super long post and I said nothing about it. The issue isn't horrible. I think mainly it lacks something to make you care about the character (Daken). The FF characters are more compelling and it's not even their book.